Calling all women who are not just travel enthusiasts but those who love to explore the mountains of Philippines! Behold for an upcoming event will surely suit your passion for outdoor adventures, the 6th All Women’s Climb – Mindanao (AWC-Mindanao). All Women’s Climb is composed of Filipina (Filipino women) who are advocates of environmental awareness and social services. It is empowered and strengthen by fellow women climbers through annual mountain climbing which generate camaraderie among fellow Filipina adventurers with their endearment, Amega. Unfortunately, nobody initiated the 6th AWC the following year due to conflicts of schedule. 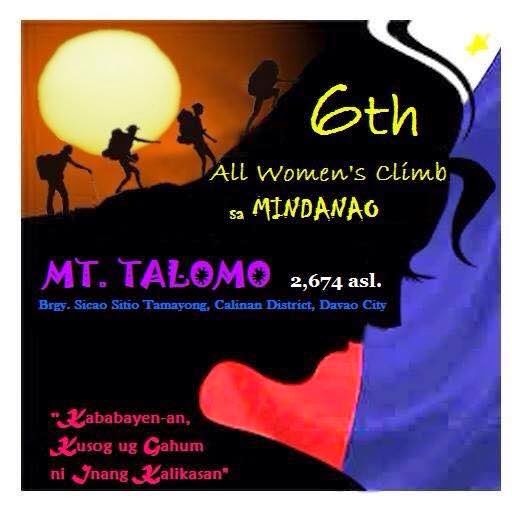 However, the eagerness of Pinay Mountaineers to bond again went to the creation of All Women’s Climb – Mindanao. 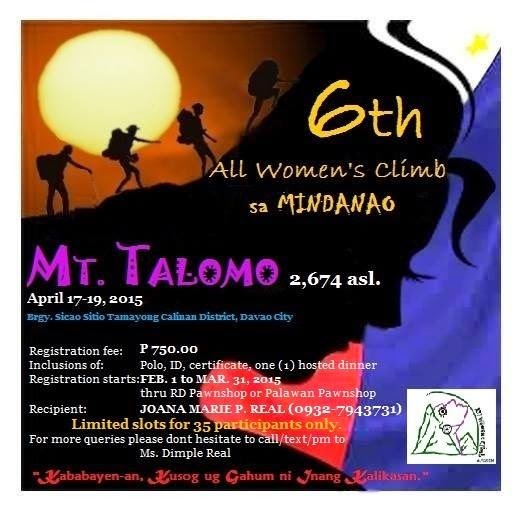 On April 17 to 19, 2015, Filipina mountaineers from Luzon, Visayas and Mindanao will be gathering again for the 6th All Women’s Climb-Mindanao. It will be hosted by the adventure groups from Davao City, Team Explorer and Latagaw, at Mt. Talomo situated in Brgy. Sicao Sitio Tamayong, Calinan District, Davao City with a theme, “Kababayen-an, Kusog og Gahum ni Inang Kalikasan”.